There's no better region than the Northeast when you're longing to get behind the wheel or rev up your motorcycle. Roads in ​New York and the New England states don't follow convention. They chase rivers and scale mountains; they wind through the U.S.'s most adorable small towns and along its most storied coastline. All 10 of these road trips are the sorts of drives you and your travel companions will remember all your lives. Allow at least the better part of a day to wind your way along any of these scenic routes, which are typically at their most spectacular in the summer or fall. You know those car commercials that show a slick vehicle navigating a wildly undulating road? Well, Route 97 from Port Jervis to Hancock, New York, has appeared in some of those ads. The twisting road traces the longest free-flowing river in the eastern U.S., which forms the border between New York State and Pennsylvania. In the summer, you'll see rafters on the Delaware River (Lander's River Trips has five launch sites along this stretch). Must-sees along this drive include Minisink Battleground Park, where ill-prepared colonists lost a skirmish with British troops during the Revolutionary War, and Roebling's Delaware Aqueduct, a canal boat bridge and marvel of engineering built in 1848. Start out from LeRoy, New York, because you'll want to tell your friends you've been to the Jell-O Gallery Museum. Then set out on Route 19 South to 19A South, where you'll find the Portageville entrance to Letchworth State Park. There are photo ops aplenty as you wiggle along park roads high above the Genesee River: one of the few rivers in the U.S. that flows south to north. Nicknamed the "Grand Canyon of the East," this dramatic gorge has 600-foot walls formed about 250 million years ago and a trio of waterfalls. In the remote northeastern part of New York's Adirondack Park, there are 46 rounded peaks that soar roughly 4,000 feet or more toward the sky. You don't need to hike them for glorious views. Set out from North Creek, New York, on Route 28N, which joins Route 30 South in Long Lake, then pick up Route 28 West in Blue Mountain Lake and follow it to Old Forge. Along the way, you'll want to allow time for a Gondola Skyride at Gore Mountain and a visit to the splendid Adirondack Experience, The Museum on Blue Mountain Lake: a sprawling complex that brings to life the people who've explored, settled, and cherished this wilderness. Yes, Vermont has a coast: a freshwater one along Lake Champlain. And Shelburne Shipyard is a picturesque spot to start a drive that affords fabulous views of the lake and its majestic backdrop, New York's Adirondacks. Head to ​Shelburne Farms, a 1,400-acre working farm built on Lake Champlain as a model agricultural estate in the late 19th-century. Pick up Route 7 South to Mount Philo State Park in Charlotte, where you can drive to the summit for panoramic lake views. Continue on Route 7 South to Route 22A through Vergennes and out to Button Bay State Park, where you can hike along a bluff overlooking Lake Champlain or even rent a boat and get out on the water. A path blazed by five Native American tribes became New England's first official scenic route in 1914. Automobiles have come a long way since then, but the 63-mile Mohawk Trail—Route 2 between Williamstown and Athol in western Massachusetts—still leads to bucolic scenes that seem little altered over the past century. Famous for its sharp Hairpin Turn, which looks out over the Hoosac Valley, it's a drive you'll particularly want to savor in the fall. Allow time to hike a portion of the Mahican-Mohawk Trail that runs through Mohawk Trail State Forest in Charlemont. It follows the original footpath trod by New England's earliest inhabitants. 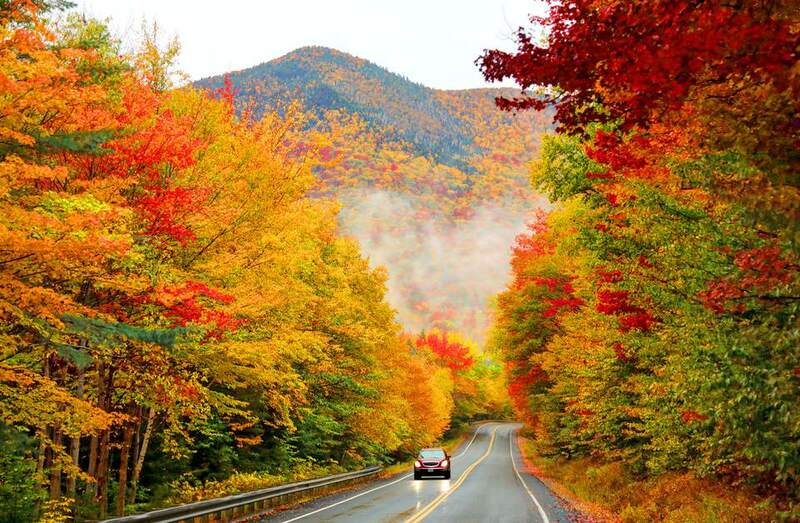 New England's ultimate scenic route—especially in the fall—is Route 112 between Conway and Lincoln, New Hampshire. Known by its Native American name, the Kancamagus (kank-ah-MAU-gus) Highway was completed in 1959, connecting these towns on the east and west sides of the 800,000-acre White Mountain National Forest. There are overlooks, hiking opportunities, historic sites, and campgrounds along this famed roadway, but even if you just motor through (be prepared to ride your brakes when fall traffic peaks), you'll be thrilled by the views of densely forested mountains and the boulder-strewn Swift River. Think of this as your "serenity now" route. Connecticut's first National Scenic Byway—Route 169 from North Woodstock to Lisbon—is a supreme leaf-peeping route that glides past farmlands and stone walls and nearly 200 homes built before the Civil War. Worthy stops on your trip include Historic New England's Roseland Cottage in Woodstock, Mashamoquet Brook State Park in Pomfret for lore and hiking, and Martha's Herbary in Pomfret for aromatic gifts. Time your drive to coincide with the U.S.'s oldest continuously held agricultural fair if you can. The Brooklyn Fair has been a late August tradition since 1809. Set your GPS for 1460 Ocean Road, Narragansett, Rhode Island, and begin this road trip at one of New England's prettiest lighthouses: Point Judith Light. Although you can't venture inside, you can stroll the grounds of this still-active beacon built in 1857. From here, you'll follow Ocean Road north to the Narragansett Town Beach, where surfers ride vigorous waves year-round and The Towers—all that remain of the Gilded Age Narragansett Pier Casino—are an enchanting backdrop. Drive Route 1A North, and you'll pass Historic New England's Casey Farm, established in 1750 and still operating and open for tours. Take Route 138 East across the Jamestown Bridge, exit onto Conanicut Island, and follow local roads south to Beavertail State Park on Beavertail Road. Here, you'll see the 1856 stone Beavertail Lighthouse, and you can venture inside the museum in the assistant keeper's house. Look east, and you'll bring your lighthouse count up to three: Castle Hill Light is visible in the distance. If you're a fan of fried clams, lobster, and fresh fish, this is the road trip for you. It starts in Gloucester, Massachusetts—the oldest seaport in the U.S.—and follows Route 127A to Route 127 along the coast north of Boston, then turns inland toward Essex on Route 133 and north once again on Route 1 to Newburyport. Along the way, you'll see Gloucester's Good Harbor Beach, one of the prettiest in New England, and the petite fishing village of Rockport, where the arts scene thrives. You'll be distracted at practically every turn by seafood shacks, but you may want to save your appetite for Essex, where fried clams were invented by Chubby Woodman. His descendants still prepare them the same way at Woodman's of Essex, and some say the golden beauties at The Clam Box up the road in Ipswich are even better, so you'll want to try both. If you're still hungry when you reach Newburyport, drive the Plum Island Turnpike out to this off-the-radar barrier island for a seafood feast at Bob Lobster. The 27-mile Park Loop Road through Maine's Acadia National Park is as exhilarating a drive as you'll find anywhere, and it's become so popular that the national park service is weighing options for controlling traffic. In the future, some stretches of the road, including the uphill drive to the summit of Cadillac Mountain, might require reservations. Until then, pack your patience if you're visiting during the busy summer season, and savor the drive through this unique landscape where mountains meet the Atlantic Ocean.